Apprenticed to Anubis - hori-nakhtmins Webseite! Ancient Egypt: Hori and his fellow students celebrate their graduation from medical school at the House of Life. In a bar brawl, he accidentally kills the vizier's eldest son. For punishment, the king renders an unusual verdict: life in the service of the dead at the weryt, the walled-off embalming compound. At the same time, young ladies at the pharaoh's court drop dead without obvious cause. When the corpses are brought to the weryt, Hori, now trained in embalming and organ removal, discovers the girls were murdered. Only he can't leave the place without turning his life sentence into a death sentence—or can he? 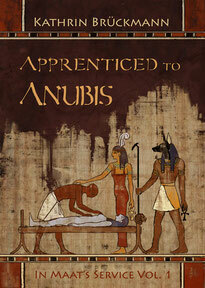 Apprenticed to Anubis as paperback and ebook available at Amazon. The print edition is also at Barnes&Noble and pretty much any online bookstore.